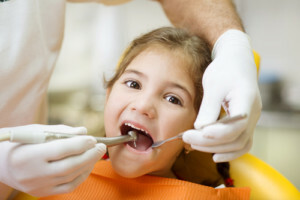 When was the last time you visited your local Newark, NJ, dentist for a teeth cleaning? According to the Academy of General Dentistry (AGD), dental cleanings need to be performed twice a year, as they are essential to maintain good oral health. Whether you are a new patient, or have been coming to American Dental Care of Newark in NJ for quite some time, our routine dental cleanings usually begin with a quick overview of your medical history. We like to know if your health has changed (new medications, pregnancy, heart problems, etc.) since your last visit, as this is important to move forward with oral treatments. An oral cancer examination & screening. A thorough evaluation of your gum tissue. A biting, chewing, and swallowing check. The preventative services portion of the dental cleaning visit usually begins with the removal of any tartar buildup both above and below the gum line. Next to be removed is plaque, which is scraped away from between the teeth with an instrument called a scaler. We finish the cleaning with a quick polish, and if the patient requests, we will do a fluoride treatment. Our team recommends getting a fluoride treatment once every 3 – 12 months, as it provides extra protection against tooth decay. While most dental cleanings normally do not exceed 30 minutes, every person’s oral hygiene is different and time may vary. At the end of every cleaning our dentists always like to offer patients the best practices for teeth cleaning in between visits. It might sound strange, but not a lot of people know the proper way to floss, or how many times a day they should be brushing. In addition, our staff will also provide the patient with future recommendations for treatment during this time that may include when to follow-up for treatment, any periodontal concerns, if the patient is interested in seeing one of our teeth whitening dentists, or if they’d like to explore restoration dental options. Remember, it’s important to schedule regular cleanings, at least twice a year, if you want healthy teeth and gums. East Orange, Newark, and Irvington, NJ, residents can schedule their appointments up to six months in advance for a routine visit. We take pride in being able to serve our community with a wide selection of services that range from simple dental cleanings to more intricate dental cosmetic procedures. If you live in the East Orange or Newark, NJ, area and would like to make an appointment for your routine cleaning, or have emergency dental care that needs to be taken care of, please give American Dental Care of Newark a call today at 973-453-9088 — we’re available 24 hours a day, seven days a week!